There are a lot of considerations to factor in when buying a graphics card. Monitor resolution, power and thermal requirements, and even game preference will dictate how much you spend and what you spend it on. The time you buy is important too. With a new generation of AMD Navi graphics cards on the horizon, buying the best now or waiting to see what the best will be in a few months time, is another tough decision to make. 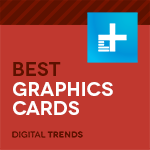 While we wait, though, here are the best graphics cards you can buy right now. Why should you buy this: The Radeon Vega VII offers fantastic performance at a competitive, if high, price. Who’s it for: Deep-pocket gamers and UHD video editors who don’t care about ray tracing. AMD’s new, second-generation Vega graphics card, the Radeon VII, might not have some of the bells and whistles of Nvidia’s RTX-line of GPUs, but what it lacks in features, it makes up for in raw power. Sucking in as much as 300 watts alone, you wouldn’t know that this GPU is running on an efficient and small-scale, 7nm node. That’s several orders of magnitude smaller than both its predecessor, the Vega 64, and Nvidia’s stiff competition. Where it lacks finesse in cooling and subsequently noise-levels, though, the Radeon VII delivers severe performance improvements over its first-generation counterpart and in many cases, Nvidia’s best too. In our testing we found the Radeon VII to be a solid competitor for the RTX 2080 and even the 2080 Ti in some cases. While that latter card is still more powerful in general (see below) the Radeon VII beats out the 2080 in most of our gaming tests and with its massive 16GB of HBM2 graphics memory, it’s a fantastic card for compute workloads too. As always, results will vary depending on your system, but in our Threadripper-based PC, it beats the competition. Near perfect for work and play, the Radeon VII is our card to buy if you can afford its steep $700 price point. Why should you buy this: You want to play the latest games at the highest frame rate and resolution. Who’s it for: 4K monitor owners and PC gaming enthusiasts. There’s nothing budget-friendly about the massive GTX 2080 Ti. Aside from the Nvidia RTX Titan, which is even more absurdly expensive and not that much faster, the RTX 2080 Ti is the most powerful consumer offering currently available in Nvidia’s arsenal, and it shows in its gaming performance. Other cards in its range, like the 2080, AMD’s Radeon VII, and the 1080 Ti, remain viable cards for delivering 4K resolution, but the 2080 Ti offers much greater performance potential whether you’re gaming at just 4K resolution, or want to bring in some of the additional visual features of the Turing generation of cards, like DLSS and ray tracing. Considering how hardware intensive the latter of those two features is, if you want to take full advantage of everything modern games like Battlefield V have to offer, the 2080 Ti delivers the best frame rates and the best overall experience. When put through its paces, we found the RTX 2080 Ti capable of delivering more than 12,000 points in 3DMark Time Spy. It also hit more than 100 FPS in Battlefield 1 at 4K with all settings at Ultra, and even hit near 50 FPS at 4K in the always-taxing Deus Ex: Mankind Divided. If you can find a 1080 Ti at a reasonable price, it’s still a viable alternative (and the 2080 isn’t a bad choice either), but the 2080 Ti is head and shoulders above them in terms of its raw power and graphical capabilities. Why should you buy this: You want to turn a PC without a GPU into a certified gaming rig. Who’s it for: Casual and occasional gamers. With a lack of affordable mid-range graphics options in Nvidia’s new RTX generation at the time of writing, we are restricted to what are effectively, last-generation solutions from both it and AMD. Although the RTX 2060 is an expensive option, we have typically recommended the GTX 1050 as a good starting point for entry-level gaming. However, AMD’s recent price reductions have made some of its cards much more competitive. The RX 560 is a little too weak for us to easily recommend, but the RX 570 is more affordable today than ever before and offers fantastic performance at its new price point. You might be wondering about some of the newer entries in the RX lineup like the RX 580 or 590. They’re both solid midrange GPUs, but until prices come down a bit more, the 570 is the best starter card. Currently available at well under $200 at a few retailers (with free games), the RX 570 delivers credible 1080p gaming performance that isn’t a million miles away from what its more capable big brother, the RX 580 can put out. In our testing, the RX 570 was able to output near 90 FPS in Battlefield 1 at 1080p with all settings on ultra – a higher frame rate than the RX 480 or even Zotac’s GTX 1060. Even more taxing games like Deus Ex: Mankind Divided proved perfectly playable at Ultra quality levels at 1080p, with average frame rates of 44 FPS. The RX 580 is a viable alternative if you have a little more money to burn as it does represent a nice uptick in performance, but bang for buck, the RX 570 is our card of choice for kicking in the door of high-fidelity PC gaming. If you want to wait a little, Nvidia now has the GTX 1660 Ti available, but it’s nowhere near as affordable as the RX 570. Why should you buy this: It offers great performance without adding undue bulk to modern laptops. Who’s it for: Power gamers on the move. Nvidia’s RTX 2080 Max-Q is the latest iteration of its leaner mobile gaming solutions, but that doesn’t mean it lacks power. It offers greater numbers of CUDA cores than its 10-series Max-Q counterparts and that ends up delivering a sizable performance improvement over the past generation. Although the RTX 2080 Max-Q falls behind its full scale desktop and mobile counterparts, its real strength lies in not outputting anywhere near the kind of heat of those big scale Gpus do. That means that you’ll still find the RTX 2080 Max-Q in laptops that are sleek and thin and don’t weigh too much. The Asus Zephyrus GX701 that we used in our testing weighs less than six pounds and offers performance that in years gone by you’d only find in chunky gaming machines that weigh at least 50 percent more than that. There are some solid alternatives in this space with both AMD and Nvidia offering mobile options with greater and lesser performance depending on your needs, but for our money, the RTX 2080 Max-Q provides the best blend of performance and compatibility with the kind of thin and light laptops that have come to dominate the gaming and general purpose notebook scene in recent years. Read our full Nvidia RTX 2080 Max-Q review. What about AMD Vega 56/64, Navi? As much as AMD has notched up a couple of solid entries on our best graphics card list, astute readers or AMD fans may have noticed a lack of first-generation Vega and AMD’s upcoming Navi graphics cards. Why is that? Don’t get us wrong, the AMD Vega 56 and 64 with their newly reduced pricing still represent great graphics cards, especially in comparison to the last remaining Nvidia GTX 10-series GPUs that some retailers still hold stock of. However, they fall well behind the top RTX graphics cards and AMD’s own Radeon VII. Their bang for buck isn’t bad, but considering the advanced features offered by other RTX cards and the greater value to be had from AMD’s other cards, they don’t quite make the cut of the “best” graphics cards. They’re good, just not great. As for Navi, we don’t know exactly what it will be like, but the latest rumors suggest that it will offer Vega-like performance at a much more affordable price point. That could mean they end up replacing our recommendations for best budget and bang for buck cards, but it’s unlikely Navi will unseat Nvidia’s most powerful graphics cards when it comes to 4K gaming – at least initially. None of AMD’s cards support Nvidia’s newly-pushed ray tracing or DLSS features either, so there is an argument to be made that Nvidia cards offer the most visual features. However, with a limited number of games supporting those new technologies at this time, the jury is still out on whether they will become mainstay gaming features, or more niche offerings for Nvidia users only. When we test graphics cards, we tend to focus on three major factors: Feature set, performance, and price. Feature set is often determined by brand and platform, which we always consider as we review a card. It’s not just about whether it can handle a virtual reality headset, or how many monitors it supports. We check out graphical standard and API support, and special features like Nvidia’s Ansel, or AMD’s WattMan overclocking software. Of course, performance is key. We run review units through a series of synthetic and real-world benchmarks, even beyond those we report. We keep detailed records of frame rate trends, frame times, and any anomalous activities, like noise, heat, or artifacts. Ultimately, it all comes down to cash. With so many GPUs, board partners, and differences in clock speed and memory, there’s no shortage of options, and it’s all too easy to overpay. We check the price of each individual card, and even help determine availability at launch.